This season’s mesmerising Premier League title race is set for a gripping finale this weekend, with three teams potentially in the mix for English football’s top prize. The last few weeks have consisted of a multitude of twists, turns and most recently tears as Liverpool, Man City and Chelsea have frequently traded positions at the top of the table. However, events of the last few days means that it is City who are firmly in pole position to be crowned champions come Sunday. Below we assess the chances and credentials of each of the three teams still in contention for England’s finest trophy. The title pendulum has been frantically swinging from London to Merseyide to Manchester, but it now looks to have set on the latter following Liverpool’s recent collapse. Just over a week ago the Reds looked to have it all sown up after they beat City, who then dropped points to Sunderland, with Chelsea then losing to the Black Cats. However, the Citizens have since bounced back with three consecutive victories, whereas the Reds have self-destructed following a defeat to Chelsea and a catastrophic collapse against Crystal Palace. As a result Manuel Pellegrini’s men are now in pole position to win their second title in three seasons, which can be achieved with back-to-back home wins against Aston Villa and West Ham in their final two games. 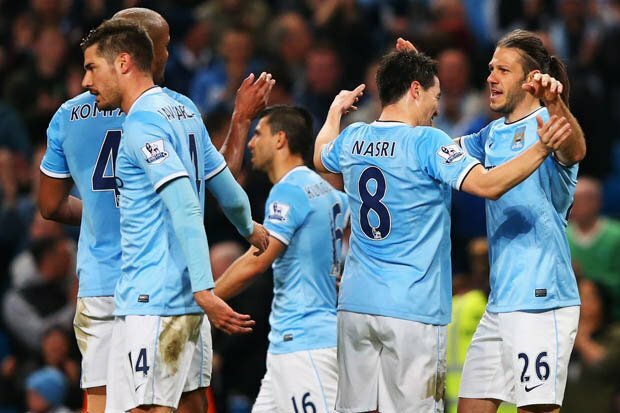 City have already won the Capital One Cup and what a season it would prove to be if they regained the title. As stated above Liverpool were well on course for ending 24 years of hurt and securing their first top-flight title since way back in 1990. However, they have imploded in the last week, leaving their hopes of winning the title out of their hands. The Reds may have the league’s most feared attack but they are often left hopelessly exposed at the back, as was the case against Palace, when they threw away a three goal lead with just 11 minutes remaining, meaning they had to settle for a point. Liverpool may have blown it in most people’s eyes but the unpredictable and dramatic nature of this season’s Premier League means that anything is still possible. In all likeliness City will wrap up the title by taking maximum points against Villa or West Ham. However, with the pressure now firmly on their shoulders there is always the possibility of a slip up, that could come in the shape of a shock defeat to Villa on Wednesday, which would incredibly hurl the ball back in Liverpool’s court. Despite drawing at home to Norwich last weekend Chelsea are remarkably still not out of contention, although their extremely faint hopes of winning the title are reflected in their overwhelmingly long odds of 200/1. If City win on Wednesday then the Blues will no longer be in the running, however if Villa get a result it means the title race will remain a three-horse race up until the final day. If that is the case Jose Mourinho’s men would then need to beat Cardiff, while hoping that both City and Liverpool lose their final games against Newcastle and West Ham respectively. This is obviously extremely unlikely but given the nature of the last few weeks, nothing is out of the question.